There are home-cooked meals and then there are nonna-cooked meals. CityMag is giving credit where it’s due to the grandmothers keeping kitchens together across the CBD, starting with Ballaboosta on Halifax Street. CityMag enters Ballaboosta on a Wednesday afternoon. The lunch rush has only recently subsided, leaving just a few diners spread throughout the outdoor seating area, happily chatting as they digest. You can visit Betty and Naj at Ballaboosta – 289 Halifax Street, Adelaide. They’re open 7.30am-9.30pm Monday to Saturday and 8am-4pm on Sundays. We’ve arrived looking for the unsung heroes of Adelaide kitchens – the nonnas, the yia yias, the tetas – and what better place to start than a restaurant that takes its name from the Yiddish word for the perfect housemaker. Greetings come from beside the wood-fired pizza oven, and as we venture closer to the kitchen we’re introduced to Betty, mother of the restaurant’s owner, Naj Moubayed. Not wanting to become too much of a distraction for the chef at work, we wait for Betty to finish what she’s doing so that we can chat and find out just how crucial she is to the café’s inner-workings. 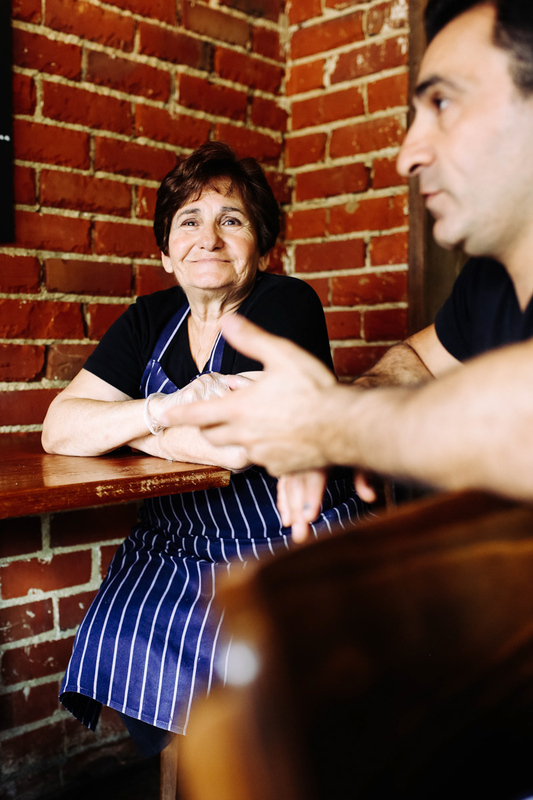 But of course, before we know it, food starts appearing from the kitchen and is placed at our table and it becomes clear why staff and customers alike refer to Betty as Aunty: no matter who you are, when you’re visiting Ballaboosta, you’re family. The last of the meal is slowly mopped up with the remaining fresh-made pita, and Aunty (yes, she’s Aunty to us now too) wanders over to sit for a chat. “You like? You like the fish?” She asks. The question seems redundant due to what little scraps of the meal are left, and her satisfied smile suggests she thinks so too. We enquire as to what this place might be like if Betty ever took a day off, but the hypothetical is quickly dismissed. “No. Sometimes I come a little bit late, but never take a day off,” she says resolutely. We chart her history with food, starting when she was 17 and cooking for her 7 younger siblings. As the eldest, a lot of the caretaker duties fell on her shoulders. The connection with food and family started there and continued into the restaurants and snack bars she had run around Adelaide, including Noah’s Ark on Hindley, in which Naj’s informal apprenticeship started as a teenager in the mid-’80s. “I was 15 and I was just chopping tomatoes, onions. I was just always in the background,” Naj says. Betty had been in retirement when Naj decided to open Ballaboosta, but it didn’t take much convincing to get her back into the kitchen, cooking with her family. When we ask for her favourite dish, Naj suggests the kibbeh (which CityMag was treated to and would highly recommend), but Betty has a little more trouble narrowing it down. “Everything. Everything. I make this dish, this nice. I make this [other] dish, this nice,” she says. True to what hospitality is really about, for Betty, cooking is about the connections you make with good food as much as it’s about the food itself. For this reason (and for the food itself) we’ll be visiting Aunty again.